I know it's been a while since our last entry. Things have been busy, but we'll try to do better. Hayden is changing so quickly, and each day is more fun than the ones before. 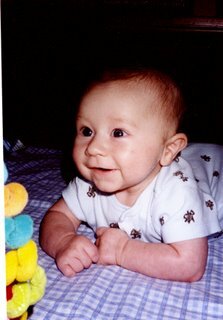 He is smiling a lot now, and he loves to communicate with his cute little coos. Here are some new pictures taken in the past few weeks. The first one was taken at WOW, our church's VBS. 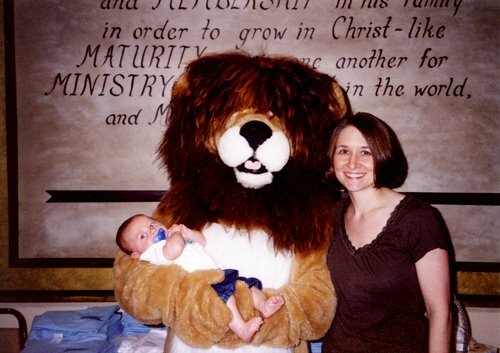 Hayden and I were lucky enough to get a picture taken with Samson, the lovable lion (a.k.a. Daddy), who is one of the kids' favorite VBS characters. 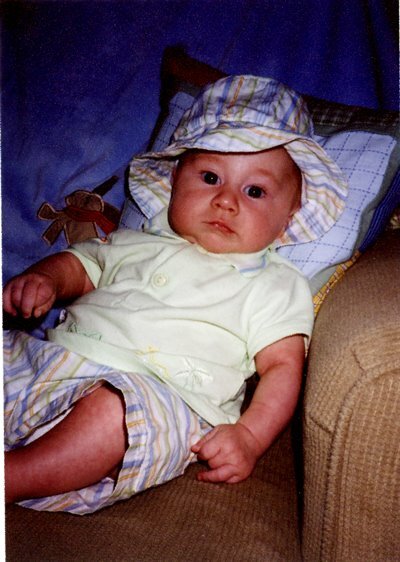 The next picture shows Hayden just chillin' in his cute little hat. I think he looks ready for the beach! Only a few weeks until we take our first Destin vacation as a family! Hayden showed off his smile in the third picture. He was actually looking at himself in his mirror while enjoying some tummy time. I think he likes what he sees! Hey Amos and Shumate and my little Hayden! He is getting so big and those pictures are too cute!! I know you are ready to take him to the beach!! Nashville needs to be in the near future too!! --! @senquanSome LV Purses sell different event or concert louis vuitton handbags outlet. Louis Cardinals Tickets, louis vuitton outlet online, Cleveland Indians Tickets, louis vuitton purses, Kansas City Royals Tickets, authentic louis vuitton handbags, Los angeles Angels Tickets etc. with a unique louis vuitton outlet online. --! @senquan.